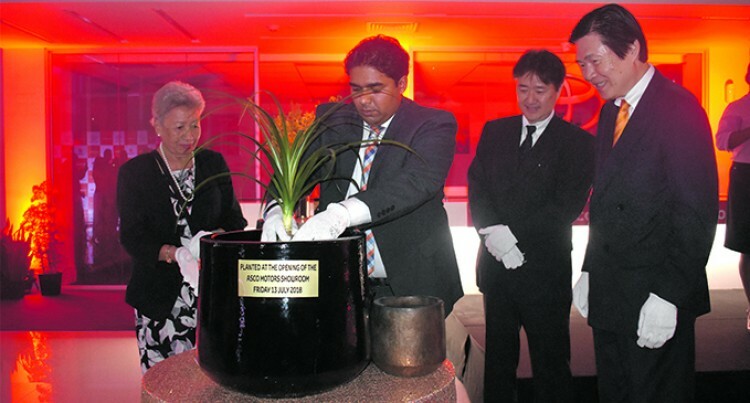 From left: Teresa Aptedthe Company Director of ASCO Motors, Craig Sims CEO of ASCO Motors, Chairman of Board Masahiro Kuwahara, and Ambassador of Japan Masahiro Omura at ASCO Motors showroom re-opening in Nabua, Suva on July 18, 2018. Photo: Sheenam Chandra. The state-of-the-art Asco Motors Nabua Suva Showroom has reopened. During the event to mark the special occasion last night Asco Motors chief executive officer Craig Sims said it took two years to plan and get the concepts together. “It all started in mid 2016 and, like most projects, went through various iterations to come to a final concept,” Mr Sims said. “Construction commenced in early 2018 and has concluded this week in time for the opening. “I wish to thank our construction and development team and in particular – Mark Swamy from LHM, Fortech Construction, Temo Consulting and Shri Singh. “Our property team in Brisbane, Australia and Ronald Kumar/ Salesh Prasad and the marketing team. “I wish to draw your attention to our updated Vision and Mission and in particular our Mission. “Words number four, five and six in this are the focus of our business – ‘Best Customer Service’. “We sell…products – Toyota/ Yamaha/ Massey Ferguson/ AVIS/ BridgeStone etc. but unless we match these world-class products with excellent customer service, we are not acting like a quality business or doing the brands credit. “A key part of excellent customer service is of course the quality of our staff and response back to you, but also the quality of our facilities. Providing a much more comfortable (air-conditioned, customer amenities) environment in which you can discuss, decide and purchase. Provide better information and product displays to enable you to enjoy the process of buying your new Toyota or Yamaha. “For both our flagship brands, you may pay a little bit more up front, but the value you get from higher uptime and a better re-sale value, is easily justified. “I wish to thank everyone for their support, your attendance and loyalty to ASCO Motors.